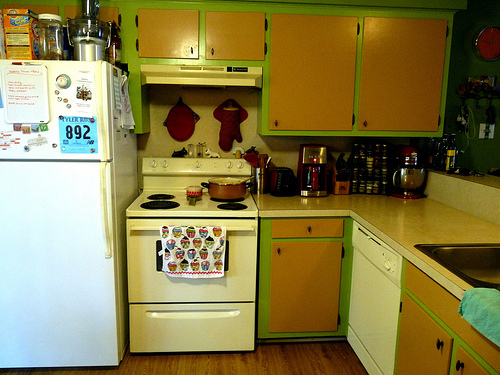 Better Than Never: Kitchen Makeover and Tour! It's hard to believe that Nathan and I have lived in our current apartment for over five years. 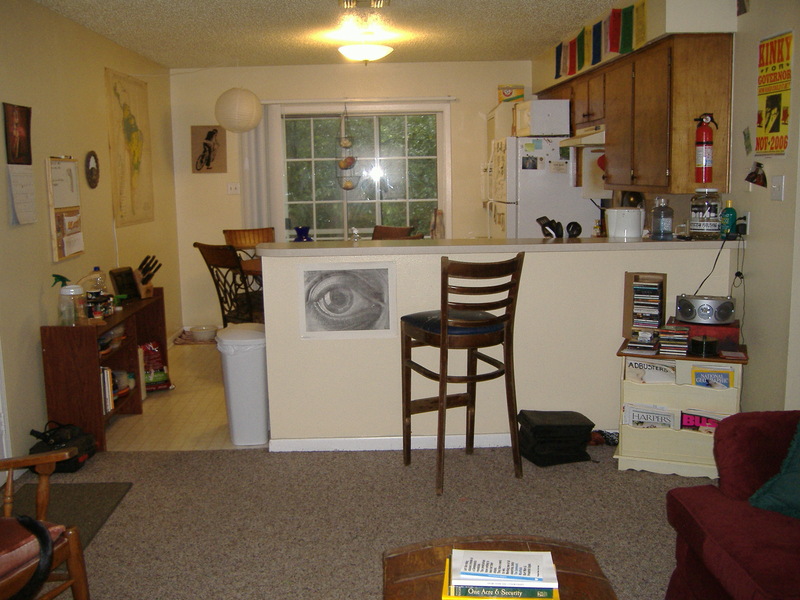 At almost 900 square feet, we make excellent use of our two bedrooms (one for sleeping, one used as a home office), living room and kitchen. While I wish we had more storage space, being stuck with nothing more than two tiny closets is actually a blessing in disguise. It keeps us from stockpiling things and we're always aware of how much STUFF we have. Because we're lucky enough to own our apartment, we're able to make improvements and changes to it as we see fit/can afford. I've already shown y'all our side yard makeover, and I figured it was time for some interior projects. 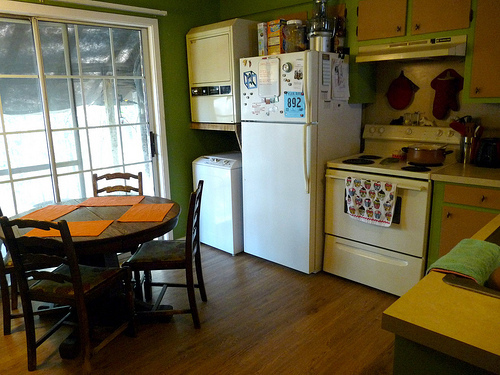 We recently redid our kitchen floor, but in digging up old "before" photos, I found some shots from when we first moved in all those moons ago, and my mouth dropped open. I guess I'd forgotten about all the little improvements we've made over the years, because the "after" images are so different. Just look! This is a shot from the living room looking into the kitchen, over the bar. 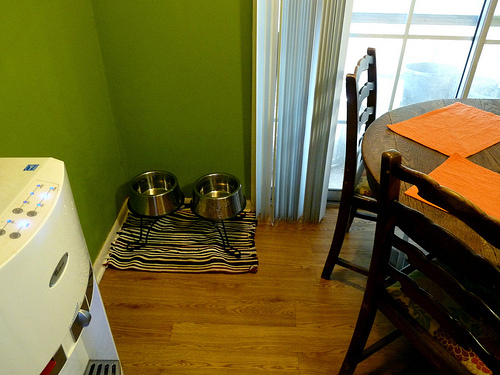 After the first year, we painted the walls a lovely green color - Olive Fringes. It was a last minute decision, mostly because my friend Ella was visiting from New York and she likes painting walls. As far as last minute decisions go, it was a good one. Nearly all of our furniture was (and still is) hand-me-downs from Nathan's parents or items we found at yard sales or out with someone's trash. We've since upgraded a lot of it (mostly with new things found at yard sales or in the trash!). We've also replaced both the dishwasher and the stove since we've lived here. The dryer (which you can see above the washing machine in the corner) is next on my list. The floor, which you can't actually see in this photo, was in the worst shape. It was already an ugly and faded linoleum when we moved in, and we only made it uglier. The turning point was when I put accidentally left a glass pie pan on a hot burner, causing the pan to explode and sending hot glass all over the kitchen, which promptly burned brown marks into the linoleum. Not cute. No matter how often you swept or mopped, the floor never looked clean. And since I spend a lot of time in the kitchen, it was extra depressing. And no one likes to be depressed. Much better! The biggest changes you can see here are the new/old kitchen table (smaller and less ornate than the one Nathan's parents gave us - we got this one from some friends who were moving and I recovered the chairs); the BEAUTIFUL NEW KITCHEN FLOOR, which we did ourselves last October-ish, and the green and brown cabinets. These were a total pain to paint, and a little odd looking at first, but I definitely love them now. New stove (our old one didn't work for a year and a year without baking is a hard burden to bear), new dishwasher, and my most-used kitchen gadgets, all in a pretty shade of red. I like to match! Because we have almost no storage space in the kitchen, Nathan built this hutch for our glasses, dishes and bigger appliances. 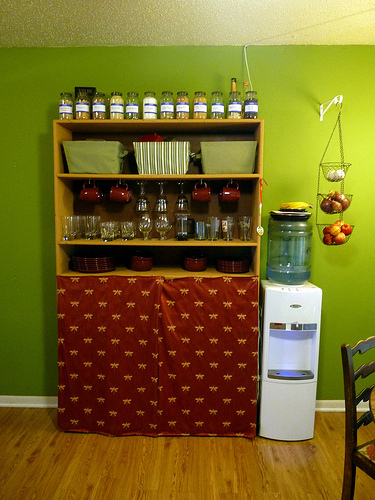 Bags of dog food, rice cooker, and large pots and pans are hidden away behind the curtain (my idea and doing!). The pretty things are visible. 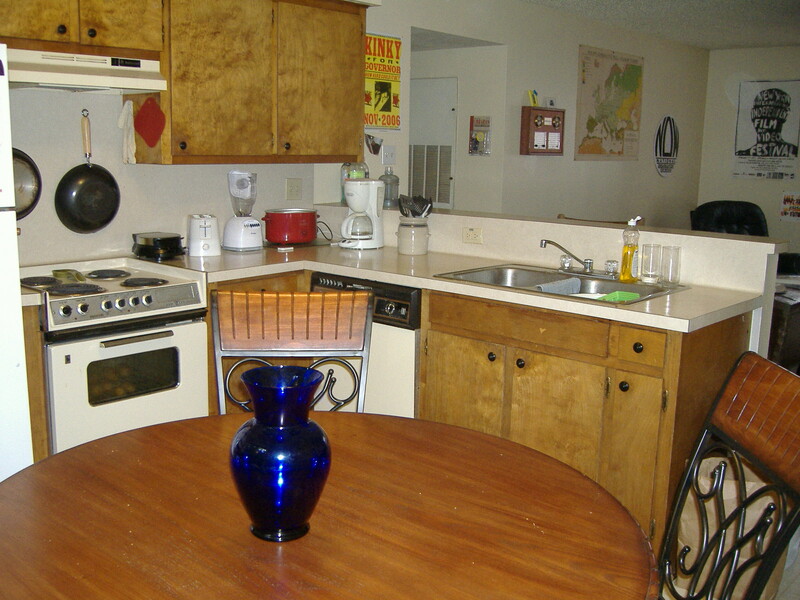 And the baskets hold spices, small kitchen gadgets, and clean rags and dishtowels, respectively. Let's look at that beautiful kitchen floor once more, shall we? Ahh. 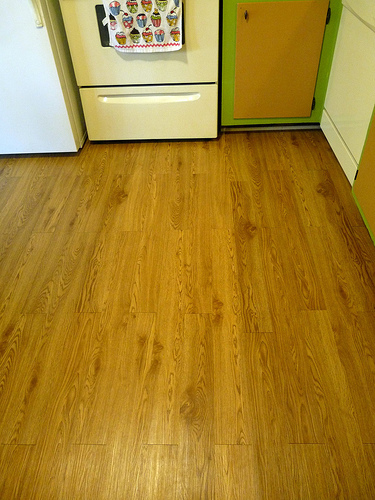 This was actually really easy to install - the "wood" is really linoleum that we stuck on over the old stuff in strips. The only trouble we ran into was the corners and areas where Nathan had to cut the strips to fit, but even that wasn't too bad. (So says the girl who didn't actually do it.) The nicest thing is that because the new floor is a bit darker than the terrible linoleum of doom, all the black dog hair that gathers on every surface in my apartment is harder to see. Win! These are old jars of Newman's Own Tomato Sauce that I cleaned and repurposed for storage. 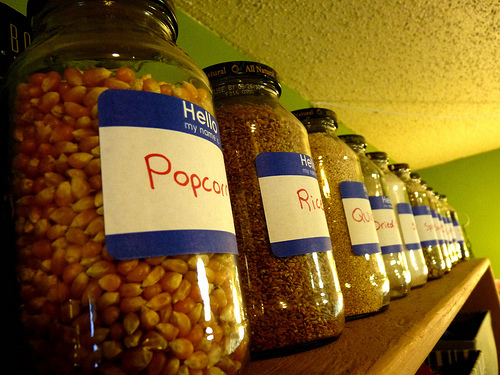 I use them for popcorn, dried beans, and grains. I was going to buy plain white labels for them, but when I saw these "Hello My Name Is" stickers, I couldn't help myself. And last but not least, the dog station. They get a placemat because they are both very messy eaters and drinkers. I will not give you a close-up of their area. No one needs to see that! And that concludes the tour of my kitchen! We're certainly no Young House Love, but I like to think we've done a good job of making the most of what we've got. 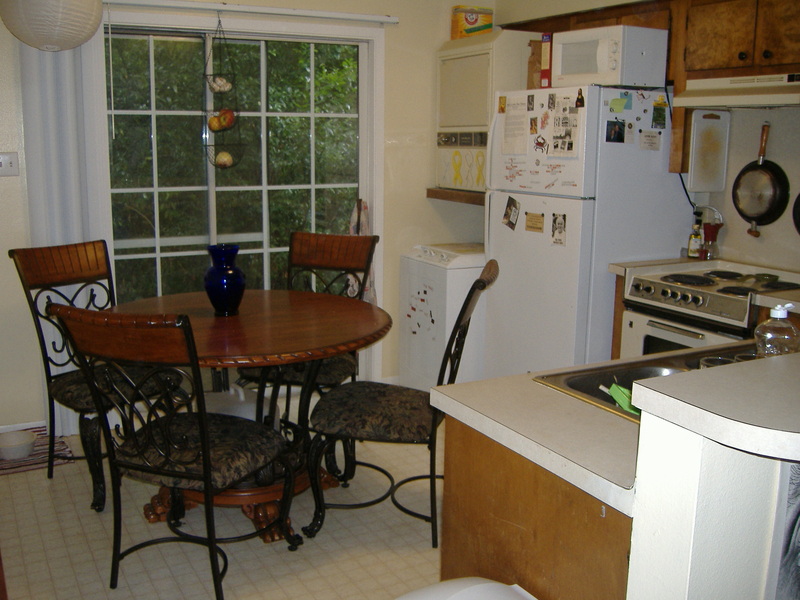 Do you enjoy "nesting" and home improvement projects? Do you have any links of your own transformations? I have to admit, I prefer painting walls and sewing things like curtains and pillows to out-and-out construction projects, but Nathan is always getting me to hold boards in place while he hammers, and I suppose it's good to expand my home improvement repertoire. And when the results are as drastic as our kitchen transformation, I really can't complain.